My dear friend and Puerto Rican cooking muse, Luis, approves of this simple, flavorful dish. The hard part (which isn’t all that hard) is making the recaíto. This frothy, emerald mix of aromatic herbs and spicy peppers will bring a little Cocina Criolla right into your kitchen. Since learning how to make recaíto, I always keep a batch in my freezer. It’s a miracle condiment, bringing bright, fresh flavors to soups, stir-frys, meats, and in this case, shellfish. 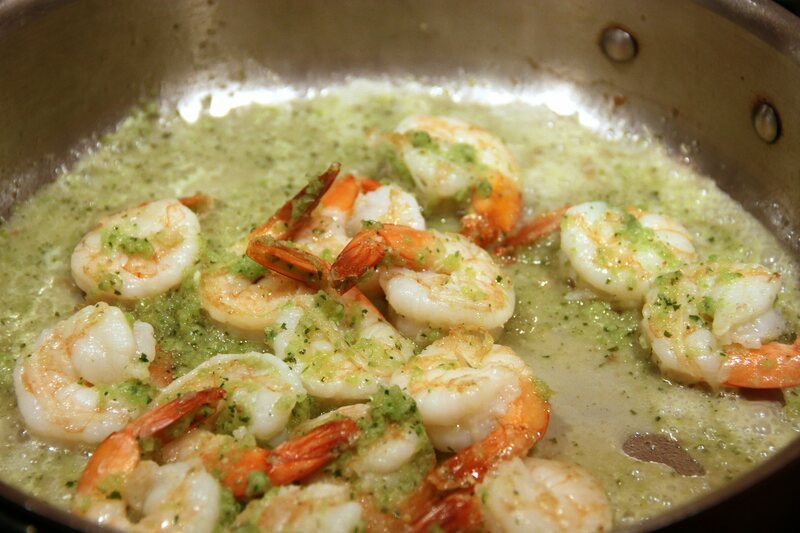 Simply sauté some peeled shrimp, then add the recaíto and lime juice for the last minute or two. 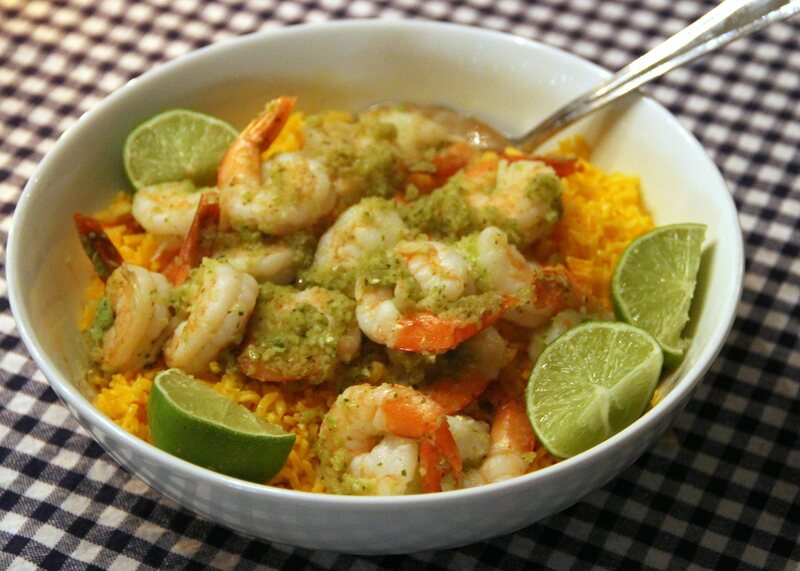 Serve it over yellow rice, maybe add steamed vegetables as a side, and this Shrimp Recaíto may become your new favorite 30-minute meal. Buen provecho! Wash limes. Juice two limes, and slice the third lime into wedges for garnish. Set aside. Pour olive oil into heavy frying pan and heat over medium heat. Add shrimp. 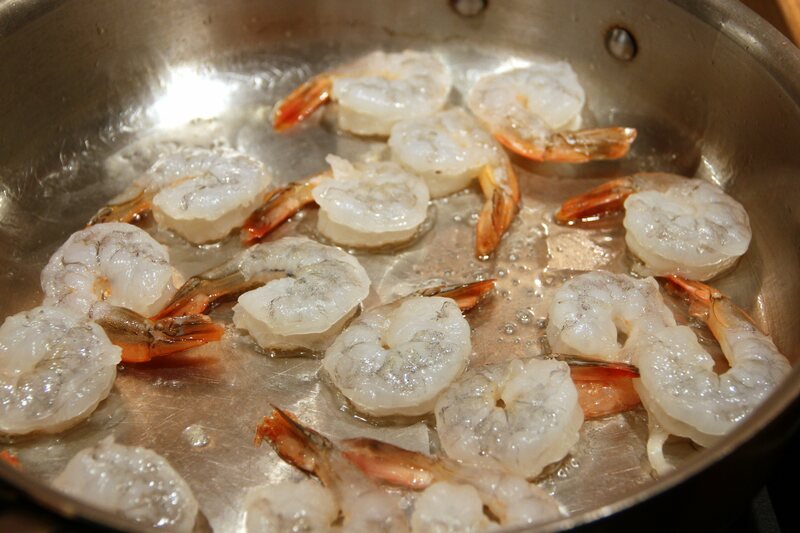 Sauté until shrimp turns lightly pink, turning once, 2 to 3 minutes per side. 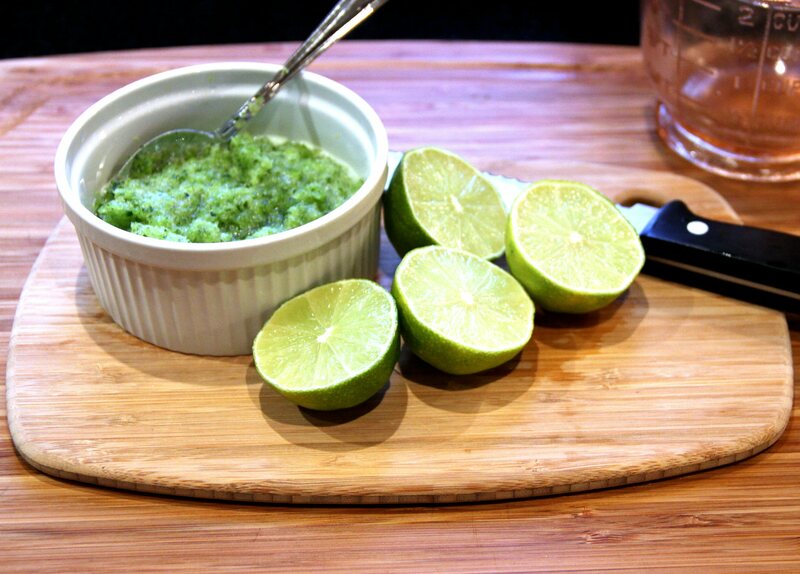 Stir in lime juice and recaíto, and cook for another minute or two. Serve over yellow rice with lime wedges on the side. Shrimp & citrus…marriage made in heaven. Yum! I agree! Nice, light summer flavors. Thanks for the thumbs up! As you become more familiar with Puerto Rican cuisine, I’m sure you will find all kinds of great ideas. The food is infused with such an interesting combination of flavors. Let me know if you try it! That looks pretty great! I love good shrimp!